The strongest and most complete protection available today for Borland Delphi and C++ Builder. 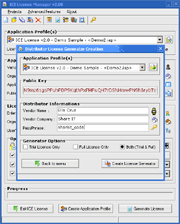 ICE License v2.0 is a new and innovative licensing protection system for Borland developers wishing to integrate copy protection and maximum security into their applications. 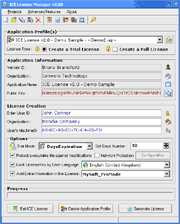 With ICE License you can create "Trial Editions" of your software. Key generation is prevented using sophisticated asymmetric encryption technology. 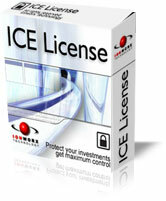 ICE License is regularly evaluated by professional developers around the world. Their findings repeatedly demonstrate that this tool has many advantages over other copy-protection systems. 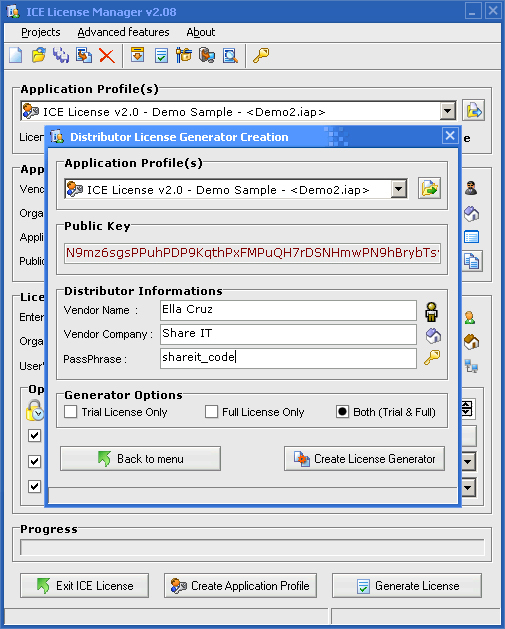 ICE License v2.0 is an innovative and complete licensing and VCL copy protection system designed to provide a high level of security. With ICE License v2.0 it's easy to turn your application into "try-before-you-buy" versions with little effort, offering everything to guarantee maximum protection. If you want to protect your investments, ICE License is designed specifically for you. 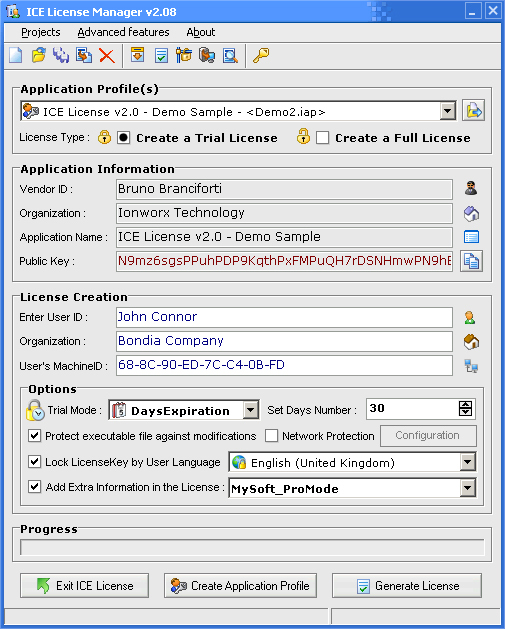 ICE License v2.0 has been created for the software developer looking for powerful and flexible protection, license management tools and to retain total control of their software products when delivering them into the hands of their customers. Building one product version and using digital licensing to partition that product through license-based feature access controls reduces the need for distinct product upgrades and saves engineering and quality assurance costs. ICE License Protection can help you prevent key generation and therefore help to protect your investment. ICE License v2.0 contains antidebugging and antimonitoring routines which provide a good way to prevent people from spying on your software. ICE License contains special code to defeat most Debuggers and Monitors including W32Dasm, SoftIce, TRW 2000, Turbo Debugger, Sourcer, Filemon, ExeSpy, ResSpy, RegMon, InCTRL 5 and Memory Monitor (more...) which are all tools in the crackers toolkit. You can protect your Applications developed and running under Win95, Win98, WinNT and Win2000, WinXP. ICE License Protection provides a high barrier against illegal copy using the power of Elliptic Curves Asymmetric Encryption to protect your application. The Elliptic Curves encryption system allows for the transmission of secret information over an open channel without a common secret key previously shared between the ends of the transmission. Your application is protected by two keys; One key (public key) is inside your application and the second is a private key known only to the developer. These two keys are used in combination to encrypt and decrypt the software Key. Even if cracker can access at the source of ICE License protection, he cannot make key generator, due to the Elliptic Curves Asymmetric Encryption (based on public key asymmetric) systems, example : RSA Encryption, the source is available on the net, but it's very hard to break. Only you can control the software license creation so that no key generator can be made! Fragments of code are marked in your source code by using special start and end marks. 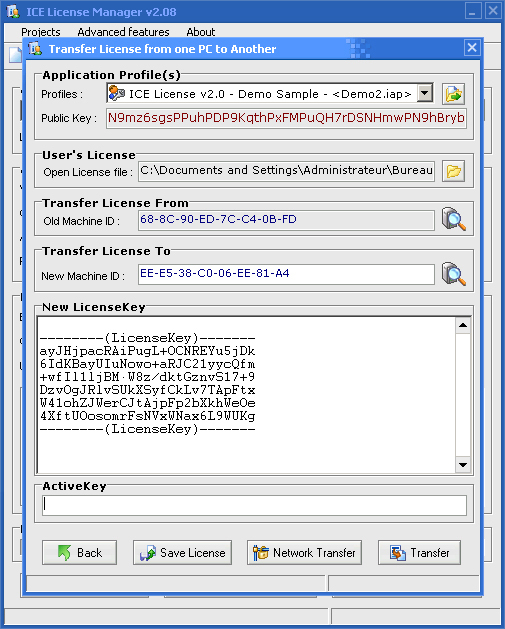 These fragments of code are recognized by ICE License in the compiled application and are additionally encrypted during the protection process. Runtime encrypted code always stays encrypted in memory. It's managed by special code each time it should be executed. Due to the encrypted blocks inside your software, your program cannot be completely cracked without a real key. 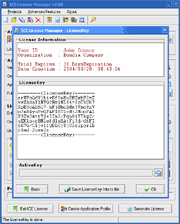 This ActiveKey can be provided only in the Full License Key. Even if cracker can access at the source of ICE License protection, he cannot crack (to turn in full) your software, because inside your compiled executable, the key for decryption is not inside, it's different approach than other protection. ICE License Protection uses a hash algorithm to create a highly advanced digital signature to check for program tampering. This protects your executable against modifications. In essence, we use MD5 and CRC32 to verify data integrity, and is much more reliable than checksum and many other commonly used methods. With the SecureStrings feature, you can encrypt all strings in your application. SecureStrings encrypt and decrypt in memory to protect them from being viewed or changed by anyone other than developer. These options provide good protection against executable modification. All ICE License information is encrypted and protected in your project resource to reduce the risk of being cracked. Machine locking prevents your software from being illegally duplicated and used on other machines. 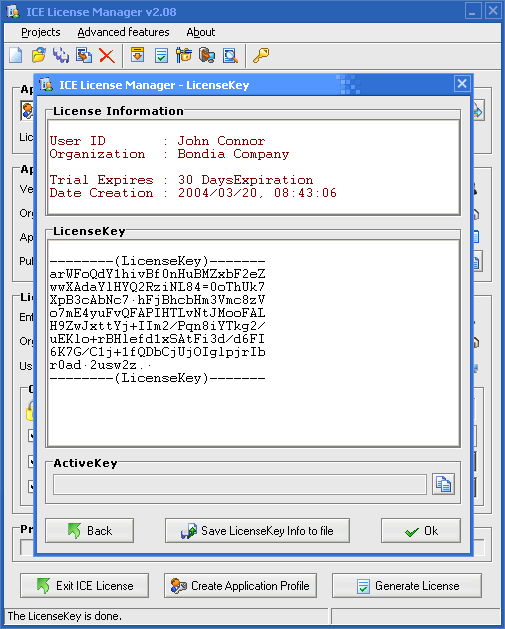 The License can be run on the specified machine only. This protection it's based on CPU, Bios and Hard Disk manufacturer identification. This protection is not based on the getvolume and other routines that require you to send a new license if the user reformats their HDD. · 1) - Remove the old license and prevent it from being used on the old computer. · 2) - Transfer the license to a new computer. ICE License allows you to control licenses on your customer's machines reliably using Machine ID protection. ICE License is the first and only protection which enables you to retain total control of licenses using country locking. With this new technique, you can prevent illegal exportation of the LicenseKey. If you create a LicenseKey for a customer located in the United States, other people from around the world cannot use this LicenseKey. Even if a customer tries to deploy or supply the LicenseKey for other people arould the world, the LicenseKey will be not valid. This technique allows you to protect your LicenseKey against illegal warez or serialz websites. ICE License Protection allows you to create a key generator for your Distributor or Partner to allow them to create licenses for your customers without the need to contact you. 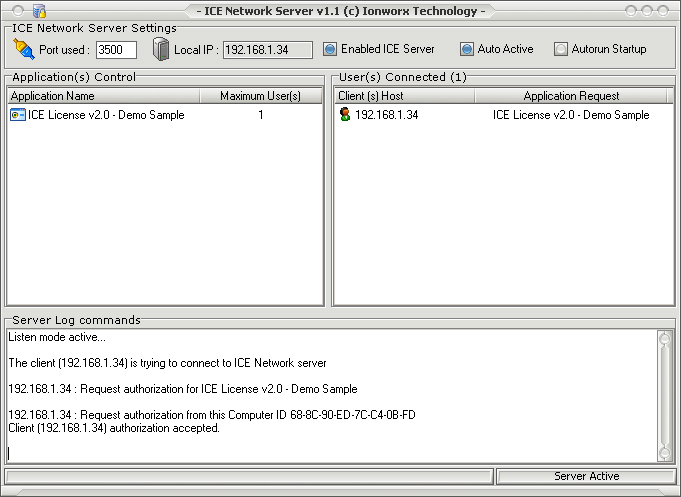 ICE License is designed for networks and allows you to control the number of simultaneous users. 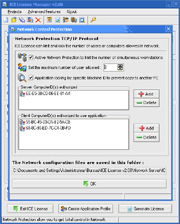 It lets you effectively license your application in network environments by controlling the number of software copies that can run at the same time or by assigning the application to specific workstations by Computer ID. By assigning a LicenseKey to a computer in the network, you can secure your application against unauthorized use and monitor the number of workstations using your application simultaneously. 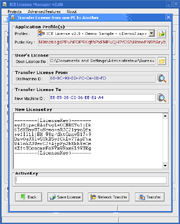 ICE License can prohibit the copying of your software from the server hard drive, limit the number of simultaneous workstations, or assign the application to specific workstations by Computer ID. 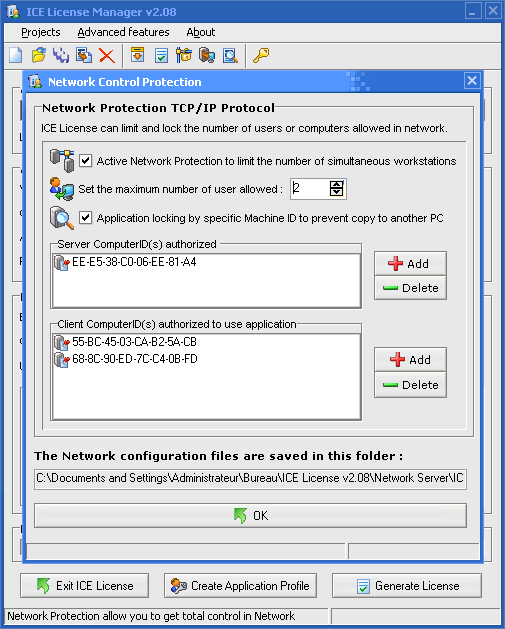 ICE License can limit and lock the number of allowed network users or computers. · Prevent and Control your LicenseKey against illegal exportation - New ! ICE License actually resists piracy and also prevents the spread of universal cracking methods. No one knows ICE License better than we do. Our solution is a complex piece of software. It has to be to make it secure. If you don't have the time for implentation or are having some difficulty implementing our component, we offer a service for ICE License Protection implementation in your application source code using remote control (under an internationally binding Non Disclosure Agreement, if you wish). This gives you the best possible protection at an affordable price. Why ICE License VCL than Executable (PE) Encryptor ? First advantage - With VCL Delphi Protection you are protected against generic cracks because the protection implementation resides inside the executable is always different. To increase security, you have option to select PE Packer (or add the PE Cryptor Envelope). As a result, the cracker would have to spend much more time to write a crack or patch for your software. Second advantage - With VCL Delphi you can get the source of the protection system to customize the code. You can create a variant of the protection to avoid generic cracks or patches, improve the protection if you find a generic patch, or you can add some functions or features. This also allows for you to sometimes fix bugs before a patch is issued. Third advantage - With VCL Delphi, the protection is inside your code. You can implement trap techniques to detect easily if the software has been cracked. ICE License prevents key generation or cracks because we use Asymmetric Encryption for license creation and Runtime Source Code Encryption to secure your software. This means ICE License can encrypt some blocks inside your source code that cannot be decrypted without a valid key. The main problem with PE Cryptor or PE Protector is that a Cracker can make a generic unpacker or decryptor to remove the protection since the protection is implemented in executable header. Example : If another software package uses the PE Protector tools and a cracker has made an unpacker for this software, your software can be cracked with a same unpacker ! We are not saying PE Protector/Cryptor is bad form of protection. PE Protector/Cryptor can provide a good first level of protection, but can leave your software vulnerable since you generally can find a decryptor or unpacker to remove it. You might mix a PE Protector and a VCL product to increase security, but be sure to try to find any vulnerabilities before you implement them. You can search for vulnerabilities by using a web search engine like Google by typing : "unpacker protectionname". You provided the source of ICE License, so it's easy to crack ?